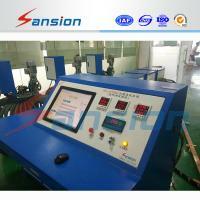 Home Companies Sansion Power Electric Co., Ltd.
Sansion Power Electric Co., Ltd.
DDG Primary Current Injection Test Set is suitable for current load test and temperature rise test on various circuit breakers, switchgears, CT/PT and others electric equipments. DDG Primary Current Injection Test Set is widely used in power division and industry mining enterprises. √ Could be designed to separate or compact structure according to the volume and weight. Easy to move. √ Output current no-polarity adjusts. √ High stability of current rising. √ Wide range of load changing. √ Two current meters, can read measurement range easily. √ Reliable and easy to operate. For example"0.5/1":"0.5"is in series;"1"is in parallel. Please contact with us for further information, our technically expereinced expertise team will select correctly designed test set for you. Warranty: One year quality guarantee after shipment.